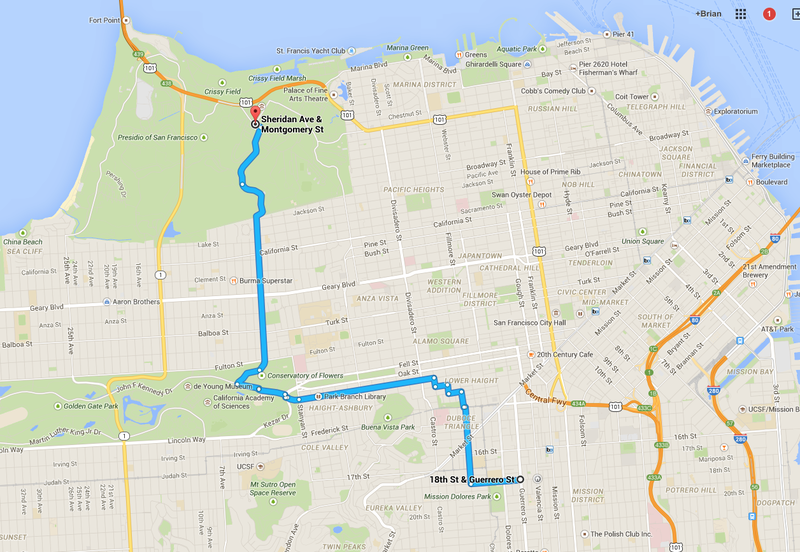 Do you know the way to the Presidio? Getting to work. We all have to get there from home unless we work from home. We have our routine commute or possibly two ways to get there (driving some days and bus others, or biking some days and walking others). But what do you do if your office is relocated or you start a new job in a new location? How do you get to your new office - especially if it's a place you have rarely been to before. 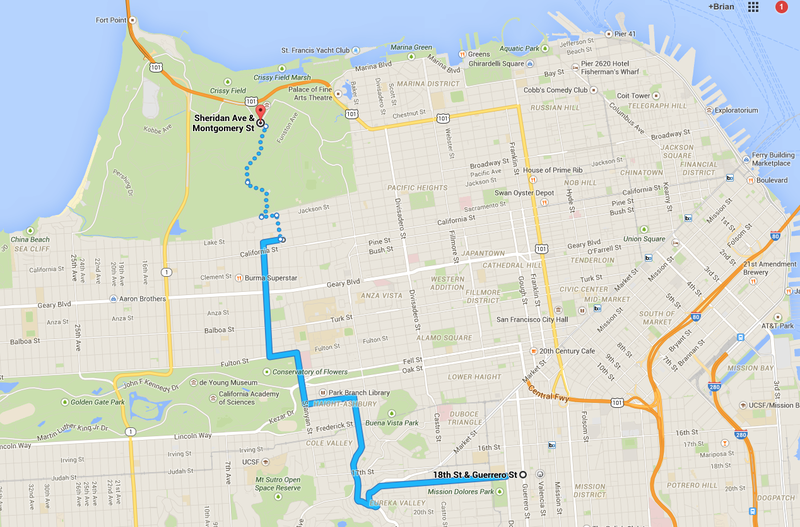 Namely, do you know the way to the Presidio? 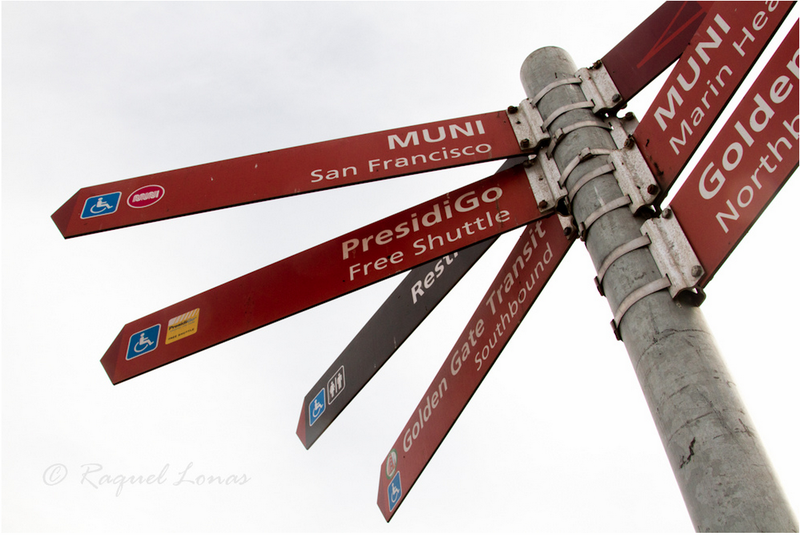 Signpost to transit in the Presidio. Note that restrooms could be transit, just not the kind I'm talking about. You should try a mix of modes depending on the day of the week, the time of day, and of course how long and how comfortable each mode. You're also up for trying different routes for any of these modes. Weather even plays into which modes to use, especially for walking and biking. 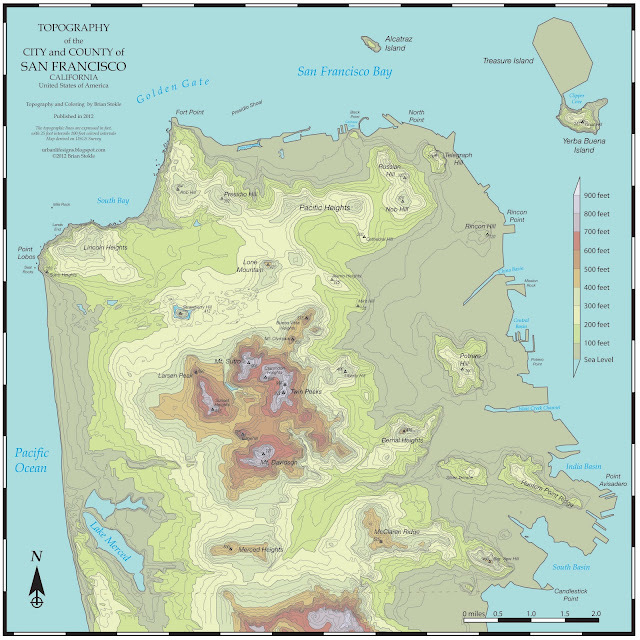 My friend Anne Franklin, who lives in the Mission, previously commuted to Potrero Hill. Recently her packaging design firm, DDW, relocated to the Presidio. 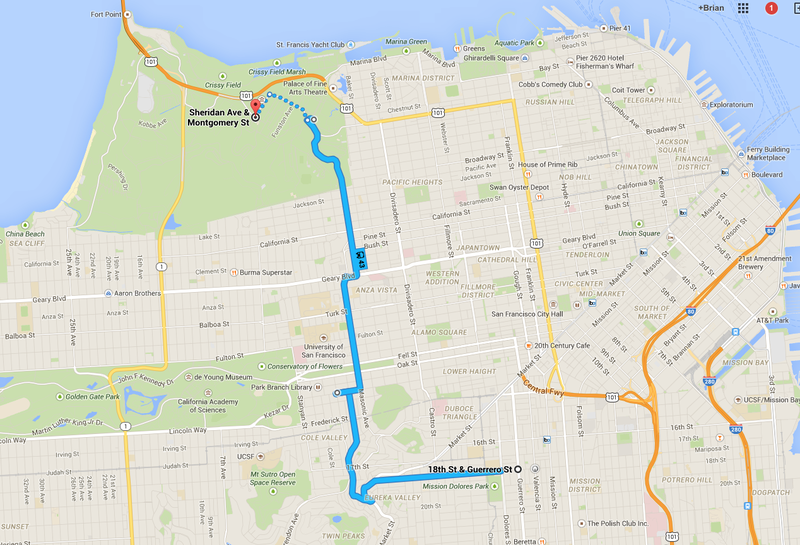 The Presidio is a beautiful place - really a park, but it's far away from the Mission, and has limited transit access. Before the office move, she walked to work, and occasionally take transit. Anne does not own a car. So how should she get to work from 18th St and Valencia? So far she's tried three options: Muni via the 33 & 43, the PresidiGo shuttle, and taking the 33 and walking through the Presidio. I've made a new poll for folks to vote for the best way to commute between the Mission. Please vote for what you think would be the best: a combination of fastest, most comfortable and not too expensive or frustrating. You can find the poll on the web site version of Urban Life Signs in the right column. Below is a list of the three ways Anne has tried out for getting to work, then several other ways to consider. 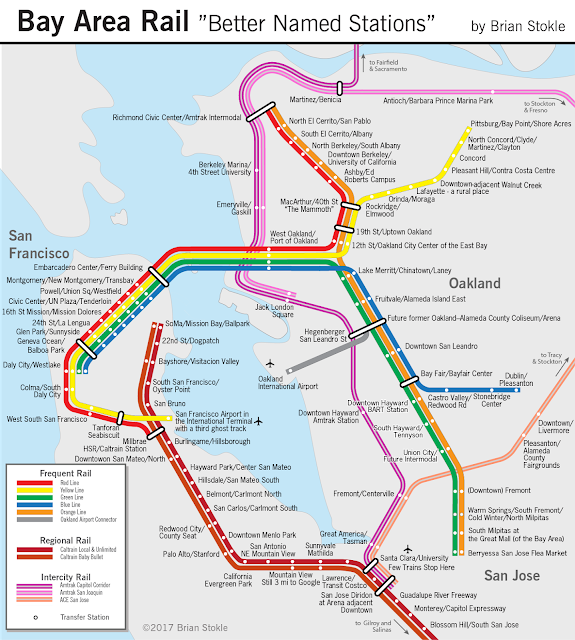 B: PresidiGo - Take BART to Embarcadero Station. Transfer to the PresidiGO shuttle and on to the Presidio. 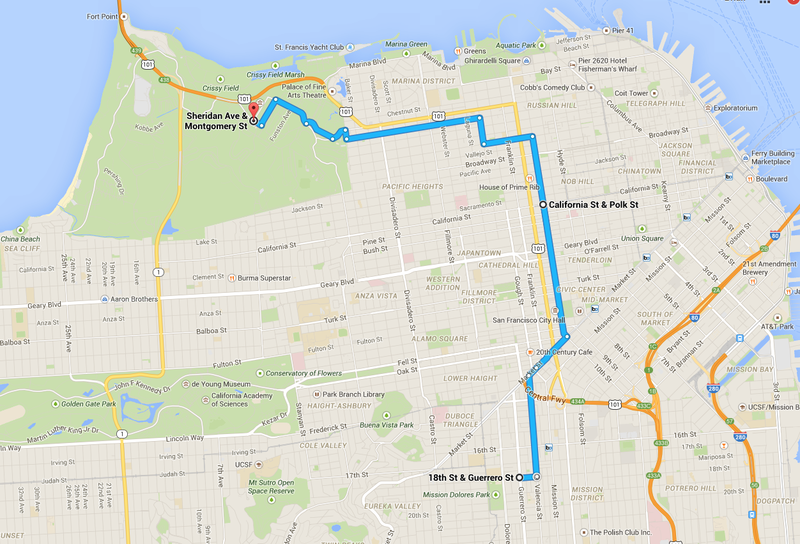 Requires a short walk to the 16th St Mission station. Going down to the platform and a short wait for a train. 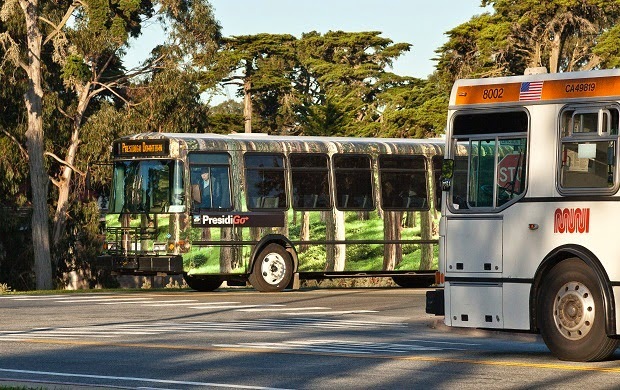 Then get off at busy Embarcadero Station and go to the surface to the nearby PresidiGo shuttle stop on Drumm at California at the Hyatt Regency. 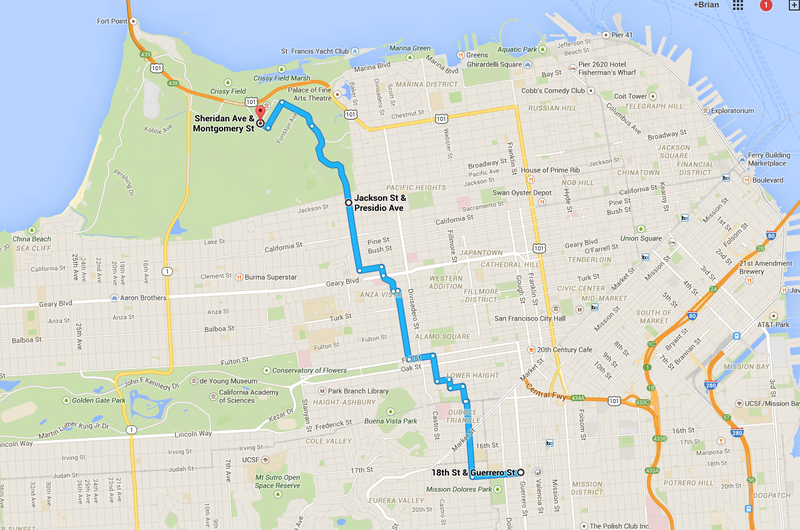 Route follows the Ecology Trail through the Presidio all the way downhill to the Main Post. Which do you think is the fastest? Which is the most affordable? 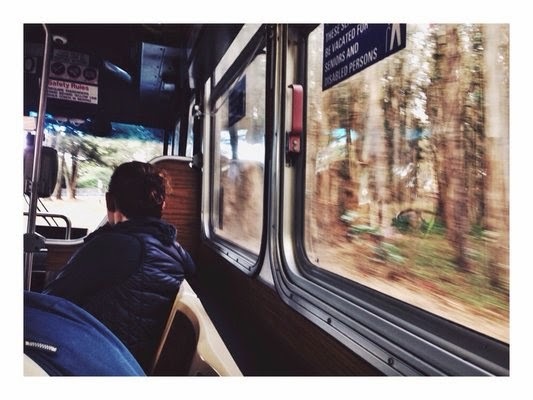 Which is the most pleasant and uncrowded commute? Or should Anne take an alternative path? I'll be highlighting each journey in the coming weeks and months. Any comments, feedback or ideas of other commute options would be greatly appreciated. I'll highlight the experience, travel time, wait times, costs, and other elements that go into a commute. 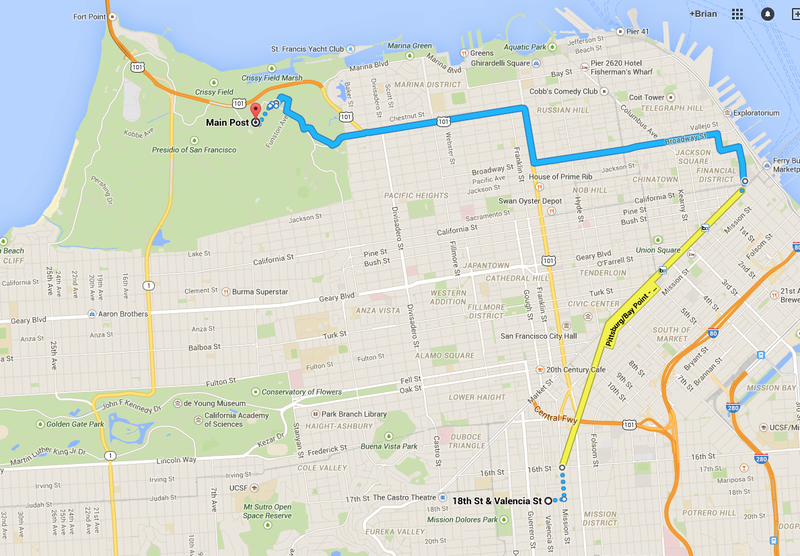 Polk Street is one of the flattest routes between central and northern San Francisco apart from the Embarcadero. 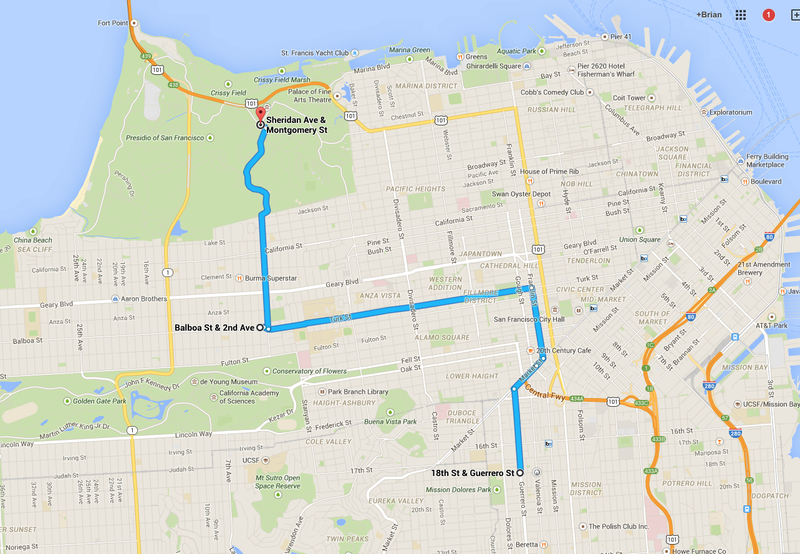 Presidio Ave would seem to offer the most direct route into the Presdio's Main Post. Remember, this requires finding (and paying for?) 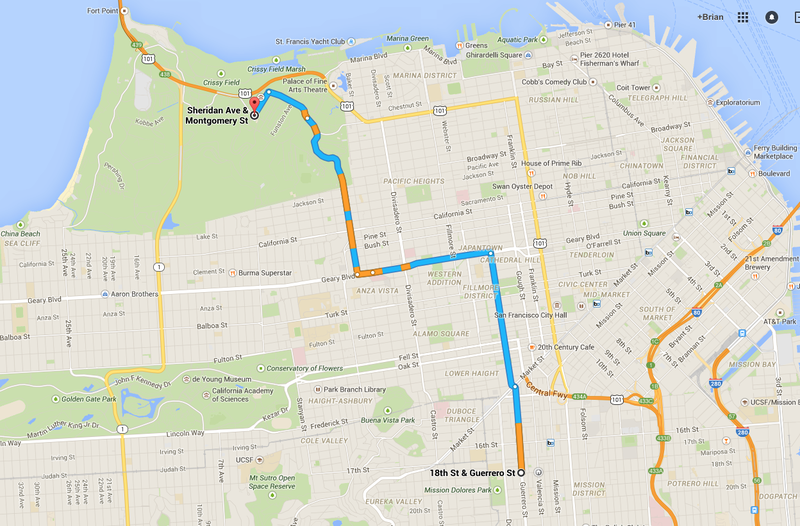 parking at the Presidio, and parking when you get back home. I've resumed that your carpool partner lives in the Inner Richmond at Balboa and 2nd Ave. (I may change this to somewhere in the Mission or nearby. Now is your chance. Help Anne decide how she should get to work. Vote on the poll on the column to the left. You have until the end of Wednesday, February 25 to vote in the poll. Do it now! Motorbike or scooter. Nice. Essentially they would follow the same route as a car (unless a scooter is super weak on hills). The main benefit would be parking on both ends - much easier than parking a car. There's also a taxi or other group car ride that you pay for. Third Street 2nd Transbay Tube is the Charm?